Increased energy efficiency while providing the lowest GWP of any non-flammable HFC refrigerant. 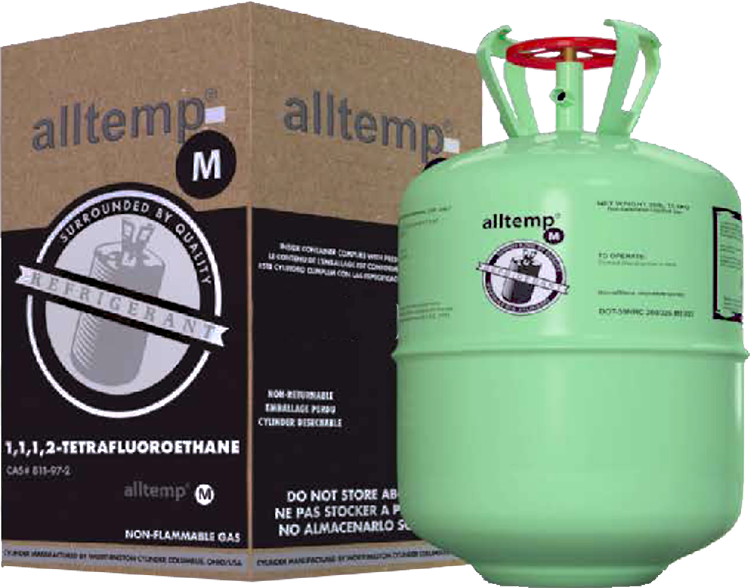 alltemp™ is a patented line of refrigerants that are composed of modified R-134a that is permanently bonded with a halo-alkaline complex manufactured to be a drop in replacements for R-22, R-134a, R-404a and R-407a/c that provides energy savings through reduced compressor amp draw an increased capacity. alltemp™ reduces compressor lift, reducing the amperage required to power the compressor while simultaneously increasing the capacity of the system over the native refrigerant, decreasing compressor runtimes. Both these benefits together combine to provide an average savings of 27%. Why do our customers need alltemp™? Customers using R22 are in a predicament. The Montreal Protocol targets the manufacturing of HCFC’s, specifically R22, to be phased out by 2020, as well as reducing the amount of R22 that’s allowed to be imported into the United States. As supplies of R22 are reduced, costs are increased leading to the increased costs of maintaining existing R22 equipment. On the other side, customers can replace their R22 equipment, but at high costs and the majority of the equipment that is available for replacement is also being scheduled for phase-out, which leaves the customer in the position of buying new equipment that will also see costs increase to maintain it. This is where alltemp™ fits into the equation. As a true drop in replacement, when alltemp is installed into existing HVAC equipment, it recertifies the equipment to be R-134a, which protects it from phase-out requirements. On top of insulating your equipment from the rising costs of R-22, alltemp provides energy significant energy savings without making any modifications to the existing equipment.